Sleepy Wrap was started 6 years ago when Elizabeth Antunovic’s (designer and co founder) daughter was born and the search for a healthier and more natural alternative to baby strollers was started. Elizabeth never felt right placing her daughter flat on her back and away from the warmth and security of her body. She and her husband started exploring the option of carrying her in a sling. While the slings they tried held her close and made her happier and more peaceful, they just didn’t feel right on their shoulders and backs. 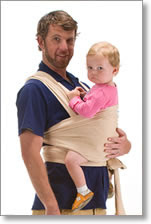 So they made the Sleepy Wrap to make both the carrier and carrier happy. I got to try the Organic Sleepy Wrap out for review with my baby model who is probably wondering right about know why it is that every time she comes for a visit I stuff her in yet another sling or wrap…lol She is a great sport though. It was simple to put on and felt really comfortable. The weight of the baby was even and I didn’t feel like I was carrying more on one side or the other. I even tried it out on Sadie who is 25lbs give or take. She too fit nicely and I can see the Sleepy Wrap being useful for hiking and a nice stroll on the beach. It costs $59.95. Visit Sleepy Wrap at www.sleepywrap.com This would make an excellent gift for both mom and dad.